Silver peace medal or "gorget." Circular medallion with molded outer edge, struck in low relief. Obverse: bust of Thomas Jefferson with legend "TH. JEFFERSON PRESIDENT OF THE US AD 1801". 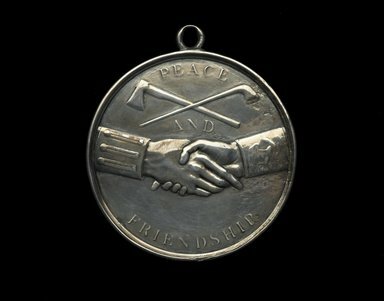 Reverse: two clasped hands, one with medal wristband and one with buttoned cuff, crossed pipe and tomahawk above, surrounding legend "PEACE AND FRIENDSHIP." Top has double loop for chain attachment. CONDITION: Good.